Oxford Editing's academic editors can provide a sample edit. We request the entire paper so that the editor can begin at the beginning and know, as any reader needs to know, your paper’s thesis. We would also like to determine the scope of work by looking over the whole manuscript to assess its overall structure. We also need to know the total word count to assess the time required to edit your paper and your cost. The editor takes into account the required style guide and the type of English when doing the sample edit. We need to know the deadline to determine which editor can edit your paper. 1) To Demonstrate What the Edit Will Look Like: The sample edit shows you what you can expect from the edit. We want to ensure that you accept and approve the edit before we begin. 2) Assessing the Scope of Work: To provide a quote (or determine if the paper is ready for editing), the editor must do a sample edit. When the editor actually edits the text, they read it very closely, on multiple levels and can see things that cannot be seen from a cursory glance. Editors can time themselves during the sample to figure out the amount of time they are spending on a page and then extrapolate that to a per-word rate. It can be somewhat difficult to assess structure in the sample as the limited sample often restricts their edit to a line edit. Because we use a sample edit instead of a flat fee, the quote is customized to your paper. Our sample edit consists of 10 percent, or 500 words of a text over 5,000 words, of the paper you submit. 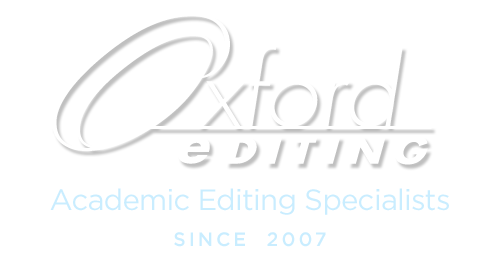 We offer this no-obligation sample edit the first time you submit a document to Oxford Editing. Please submit your entire manuscript for the no-obligation sample edit. The editor needs to see the extent of the work in order to see if the work can be completed within their existing schedule. We ask for your deadline at the beginning of the process because the editor who would edit your full paper if you decide to proceed, based on the sample edit and the cost, is the same editor who does the sample edit. Therefore, the first step in our process is knowing your deadline in order to find an editor who can meet your deadline. That editor then does the sample edit. We assume the deadline is in your time zone and that it is not the journal submission deadline but the deadline for you to revise before submitting. If the deadline is for the editor, not you, please note that. We ask for your patience as we look over your paper. Depending on your editor’s schedule, it can take two days (sometimes more) to do the sample edit. Editing is intense work that requires focus and time in addition to know-how and education. The sample edit is no different. You can see samples of our proofreading and editing by clicking on the link in the sidebar at right. If we determine that we cannot edit your paper for some reason, then we will not do the sample edit. That is, we reserve the right to refuse to do a sample edit based on a variety of criteria. When doing the sample edit, because they’re always editing on multiple levels in every editing pass, including the sample edit pass, editors like to know what the style guide is that your publisher (or university) requests. This information can usually be found in the author submission guidelines of your target journal. Our editors are familiar with the major style manuals, including The Chicago Manual of Style (CMS), Turabian, APA Style (American Psychological Association), The MLA Handbook (Modern Language Association), Harvard, Hart’s Rules (Oxford University Press), The ACS Style Guide (American Chemical Society), AMA Manual of Style (American Medical Association), AP Stylebook (Associated Press), The Blue Book, Oxford University Standard for Citation of Legal Authorities (OSCOLA), and others. We prefer to edit in Microsoft Word so that the editor can track the changes and you can see all the edits. Microsoft Word’s “Track Changes” feature shows you all the changes that your editor recommends. With the changes highlighted, you can review the edits and “Accept All Changes” after you have rejected changes you do not agree with. The Track Changes feature also provides a means for the editor to annotate and comment in the margin on any potentially significant changes; explain their suggested changes; ascertain that they have understood the meaning should there be any ambiguity in the original wording; or call out or flag a potential problem, such as lack of clarity or the need to add more data. If you have written your paper in LaTeX, we can edit the LaTeX source file. However, most of our editors prefer editing in Word. There are two disadvantages of editing in LaTeX: 1) LaTeX doesn’t allow for accepting/rejecting of changes and 2) the editor cannot make comments in the margins to communicate with you. We can edit a .pdf file format only with the greatest difficulty and so strongly discourage clients from sending us a .pdf file. One technique we recommended for putting text into a Word or .doc file is to copy and paste the text from the LaTeX source file into a Word file for the editor to edit. (We can also open an .rtf or .txt file in Word. We don’t recommend using a converting program to convert from a .pdf to Word.) After we have returned the edited document to you and you have removed the comments and accepted or rejected the edits, you can do a Save As .txt file and then convert to a .tex file. Click here send us an email if you have any questions about our services. We would be delighted to speak with you. Any writer makes mistakes when writing, and so most every writer benefits from having an editor. If you entrust your document to Oxford Editing, our editors will read your text objectively and carefully, considering it as would a first-time reader, only they scrutinize it for style, grammar, punctuation, word choice, and flow. Through the multi-phase editing process that each of our editors goes through, you can expect to receive back a document that is clear, concise, and ready-to-publish. Some of the standard writing elements that our editors look at are such stylistic devices as making the construction of your sentences parallel, structuring your paragraphs in accordance with established writing standards, eliminating unnecessary uses of the passive voice, and omitting needless words. They also repair any faulty grammatical construction and resolve or point out stumbling blocks that can stop your readers. They make sure that you have defined key terms and used them consistently and throughout the paper. This level of detail improves the coherence of your argumentation. They also ensure that the document is free of typographical and grammatical errors and that it follows your identified style guide. 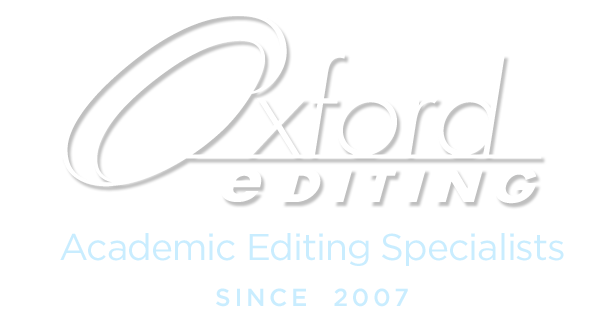 Oxford Editing’s editors review your manuscript multiple times. In their first edit, a line edit, they correct grammatical and spelling errors. They will also make sure that your document follows your designated publication style guide. If you request a more advanced edit, that is, a substantive or structural edit, your editor uses the first edit to establish a foundation for making substantive or structural changes. The substantive edit can do such things as eliminate any unnecessary repetitions and expand elliptical explanations. We also offer a content review from a peer. Please inquire about a content review in addition to a language review when you submit your document to get pricing information. Your paper would then be edited by two editors: one in your field and a professional language editor, who also is experienced in editing documents in your field, such as economics, music, archaeology, or the sciences. The editors do multiple editing passes, so the editing process is not entirely linear. As there are multiple levels on which to edit; as the editor reads pores slowly over your paper in the first reading, they make edits and capture their reaction to the text based on that first reading (they might later rethink some of those edits and modify them or remove them). They then go over the manuscript again and again with a different focus (copyediting, proofreading), once they’ve figured out the structure and direction. When our editors edit your article, dissertation, or book on a structural level, they check that your paper flows logically. They look first for a strong thesis statement and then consider the overall structure of the paper, including the structure of each paragraph. They might be able to help you write clear topic sentences for each paragraph, make sure that transitional ideas are in place, check that you have defined key terms and used them consistently (but to do this, they must know what your thesis is). They also check that your all sections conform to the standards of academic writing. They can also help less experienced authors develop their papers by suggesting ways to reorder sections of the text to improve logical order and flow of the text. Whether your paper requires a light edit or a developmental (heavy) edit, our editors take great care to retain your writing style, tone, voice, and meaning. >> Click here to see a typical sample edit. >> Click here to see our customer feedback.